Traffic Delineators are good solution for many different traffic applications. Their added height and thin profile make them great for traffic lane division. These versatile delineators can also be used to control foot traffic. The N- Top design allows you to securely attach rope from one cone to another, creating lines lanes for crowds. Our delineators meet MUTCD & NCHRP-350 requirements and are approved for use in most states. These Delineators use a recycled PVC base that is better for the planet! From use in construction situations, foot traffic control, accident management, or parking lots, traffic delineators from VIP Crowd Control are top-notch in the industry. If your project or event requires a safe environment you need delineators from VIP crowd control. Base Size 16.5" x 16.5"
3M Reflector Collar (Option) 3" x 3"
We keep our traffic delineators in stock, and we even offer same-day delivery! 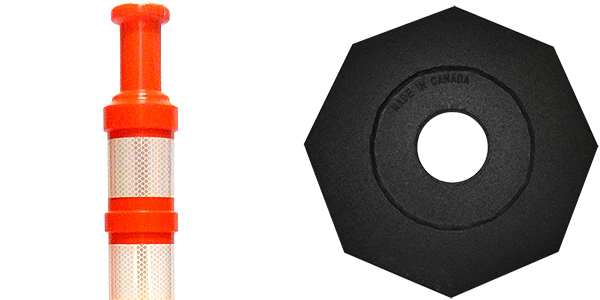 Are you looking for Traffic Cone Products? See our safety cones here!